…because I am passionate about keeping things simple in how we manage our Well-Being, how we live our lives to full potential. Our Happiness. As I reflect on the last few decades I see multi-billion dollar industries of expertise gain pace around “Well-Being”, “Leadership” and “Parenting”, throwing around all sorts of language and methods. I wonder as a society if we are any better off(1). These industries too often take us away from our very essence, encouraging us to “bring into” how we are in the moment, methods devised “out there” in another place and time. This ignores we are born into and live in Relationships in the here and now. While each Relationship is unique, the fundamentals are the same as we journey through each of our Relationships within our Family, Friends, Interests, Career and Learning(2). Our Well-Being is how we engage in Relationships with ourselves and others, and what Relationships we focus on at particular points in our journeys, be it our Family, Friends, Interests, Career or Learning. When I look at lists of “deathbed regrets” it is usually around unfulfilled Relationships, not unfulfilled goals. Let’s start with a simple example of different contexts. When I say good morning, how are you? to Margi Brown Ash, my partner of 30+ years, I will give a hug and kiss. When I enter the office and say good morning, how are you? to my work colleagues, I will dispense with the hug and kiss. In each context the same Relational fundamentals are at work, acknowledging Margi and my work colleagues as individuals, saying I value them, taking care of their and my Well-Being. No rocket science here. From this perspective, two things stand out. Focusing on being in Relationship takes the talk away from “mental illness” and “mental health” or associated words like “depression”. While they may have their place(3), used in the general language of “Well-Being” they all too often attract unhelpful judgment, of ourselves and others, freezing us from reaching out. I will discuss this in a later Post (Part 5). Even Well-Being sits uneasily with me, conjuring up ever increasing methods to enhance our Well-Being, creating anxiety as we assess ourselves as still not coping, prompting recourse to the next wave of methods. I will discuss this in a later Post. With this qualification, I will stick with “Well-Being”, not be wishing to add another term to the already confusing space of Well-Being language. QUESTION: What is the most useful language for you around Well-Being? It’s easy to grasp we have a Responsibility to take care of our Well-Being for ourselves. However, when we see our Well-Being in the context of our Relationships, this Responsibility is heightened, for our Well-Being affects others. No more so than in our roles as Partners, Parents and Leaders. The ricochet effect of us (i) not taking care of our Well-Being, (ii) not being Aware of how our Well-Being may affect those around us and (iii) with this Awareness not having the Curiosity and courage to action our Responsibility, is palpable. We cannot outsource this Responsibility. In our early years, I relied unduly on Margi for our Family’s Well-Being. I wonder if this is a male trait. In the worlds I am familiar with, legal and corporate, I see leaders outsourcing their Responsibility for the Well-Being of their teams to Human Resources as a fundamental cop out having huge repercussions(4). I will develop this in a later Post (Part 4). QUESTION: How do you see your Responsibility within your Family and your work-place? Storying it: has experienced the power of understanding how we live, our Well-Being, through stories, myths and legends. I observe this now as Margi performs her stories of belonging at the Brisbane Powerhouse, with the stirring up in her audiences their own reflections(7). As with Margi’s storytelling, in telling my stories of Well-Being, I hope to stir up in your ideas and possibilities for your own Observing and check-ins on how you are managing your Well-Being. QUESTION: Are there any stories of Well-Being that have influenced you? 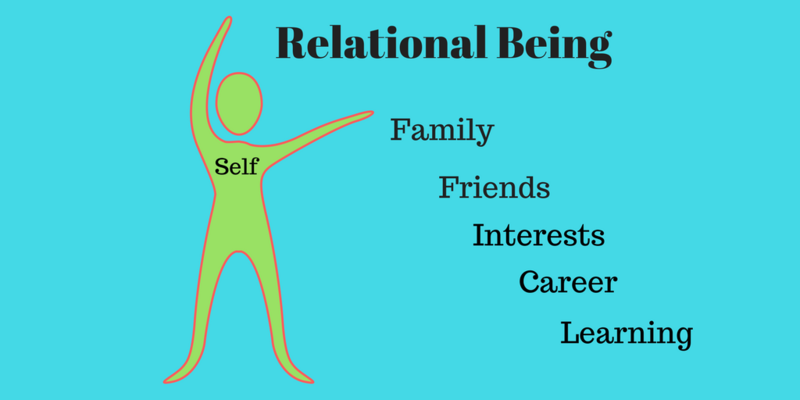 In Part 2, I will introduce 5 factors to assist us in Observing how we are performing in our Relationships, being the time-honoured ideas of Awareness, Responsibility, Request, Respect and Curiosity. In Parts 3 to 5, I will discuss these factors. ARC Coaching, Mentoring & Facilitation is all about generative questions. Let’s travel together to create possibilities. While recognising many individuals will benefit from this expertise, as I have, my suggestion is not to ignore what we already have within us. This series of Posts is really about how to become Aware of what we have and action it in the service of ourselves and others in our Relationships. The idea of Relational Being derives from Ken Gergen’s book Relational Being: Beyond Self and Community (2009). Ken has been an informal mentor since Margi and I attended a 3-day seminar with Ken and his partner Mary Gergen in Philadelphia in 2010. Of course, medical conditions, such as clinical depression, need to be acknowledged. In Being Well in the Law, A Guide for Lawyers, Law Society of NSW, 2016, two approaches to Well-Being are noted. They are worth setting out in full. My emphasis here is on Leaders. In Being Well in the Law, A Guide for Lawyers (see Footnote 3), in answer to a question who do you think is responsible for ensuring wellness is a workplace priority, Mary Digiglio, Managing Partner of Swaab Attorneys without hesitation responds: The partnership—there’s no doubt about it.